I learned Autumn Leaves during my Orff 1 training course from a phenomenal early childhood music specialist, Saskia Beverloo, who translated it from the original Dutch. I originally created this activity when I interned with the local children’s choir, but now it serves as a valuable part of our preschool collection. Local preschool groups have borrowed them, they’ve been brought out at family reunions, and my son plays with them regularly. Ultimately the $6.00 and 30 minute investment to make them has been very profitable for us. 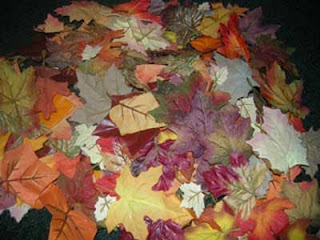 Step 1: Go to the dollar store or a craft store and purchase artificial autumn foliage. The more colorful, the better! Step 2: Using sharp scissors, trim off the leaves and discard the branches. Have a place to store your new treasure, because they will be bulky and will want to spread out. I store mine in a travel cosmetics bag. Step 3: Sing this song! Play! Have fun! If you use the song as part of a unit study, you might be interested in the autumn leaves and harvest activities on this website.